Take a 30-Minute Lunch Break With Us! In addition to our regular webinars, this fall we will begin to offer half-hour “Lunch Break” webinars that will buoy and strengthen your coalition’s health. Coalition wellness is the springboard for community wellness! Tune in to gain skills on dealing with conflict, promoting clear decision making, and using your best leadership prowess. Each 30-minute webinar will introduce a bite-sized topic with techniques that are digestible and immediately usable within the coalition. The first “Lunch Break” webinar, Coalition Health: the Heart of the Matter, will be on October 9, 2014 from 11:30 a.m. – 12:00 p.m. 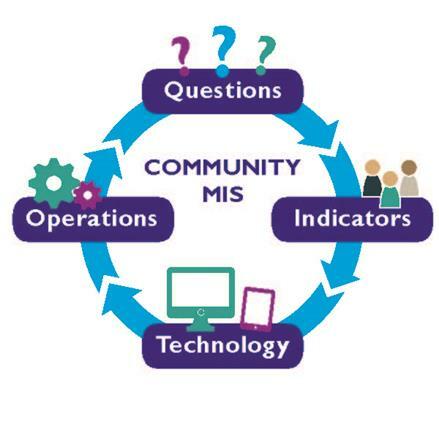 If you missed the last webinar, Working with Community Coalitions: Mission + Vision/Roles + Responsibilities, you can view it on the SPF SIG website. The webinar covered how to create long-term community change by fostering a healthy and sustainable coalition. It explored the key steps to coalition development, and how to define your coalition’s focus and ensure sustainability of both your efforts and the results. The presentation slides and related handout materials are also posted on the SPF SIG website. If you’ve ever had a storage unit, a shed out back, or a deep closet under your staircase, you know how your life “treasures” can get lost or go missing. Sometimes the effort to retrieve that treasure -- your high school yearbook or your child’s birth certificate or that funky ceramic pot that Auntie Jenny made just isn’t worth it. It’s a mess in there. The same thing goes when it comes to storing our local data in community prevention. Sometimes, our storage unit for local data about our community’s health and wellness can get really messy. Ideally at some point in time, someone on our team or coalition created a simple spreadsheet of relevant local indicators that could be helpful for grant writing and seeing how the community is changing. But more often than not, the needed data is on three different people’s computers or stuffed into a dusty file drawer with a dubious file name. And when wellness information is needed, everyone’s wondering where it went! This month we are discussing some of the storage units available for our local data, with a focuson community wellness and prevention. As you will recall, last month we talked about how important it is for the coalition to (1) determine its questions about wellness and (2) seek the indicators that measure those questions, recognizing that some data might be missing. As for storage units of data (or management information systems, MIS), we can get a variety of models just like vehicles. There’s the sleek, super-enhanced Maserati. The functional and robust enough Ford Focus. And then there’s the basic Kawasaki motorbike that gets the job done providing we remember where we parked it. Different models for different functions. A great start is the Excel spreadsheet as the MIS. Think Kawasaki. By now, your coalition has determined which areas of local data it wants to track and you can simply store and manage it. Perhaps you choose the areas of general demographics, community safety, adult health, youth wellness, and jobs/income. Under each area, your team and coalition decide which measures are important. Areas and indicators are entered into Column 1. (See MIS example.) Then the data source with published date and the next update of the measure are addressed in Columns 2 and 3, respectively. Years and months follow in subsequent columns, and values of indicators from past years to the current date can be populated in order for you to track trends. In addition, you can create graphs, charts, and dashboards from this local data. Excel works well for managing small data sets, quickly crunching similar information, and following trends. The spreadsheet can be secured with a password and placed on a shared drive in order for the community’s “data stewards” to access and use. The next step up is a relational database that can be built with software programs such as MS Access. Numerous tables will hold the local data and are joined together by common fields. Then, specific queries can be submitted and reports run. For example, you may have “high school youth” as a field in several tables (e.g., physical health, family connectivity, alcohol use) and want a report solely on high school youth in all these specific areas. Thus, you submit your query and the report rolls out this information on youth. Relational databases take a bit more knowledge and skill to operate but do offer a more flexible, adaptable way to manage your local information and report it. To build a relational database using Access tap this excellent resource. collaboration center to leverage community and statewide partnerships. Large communities and regions or states are more apt to use an online data management system such as the one above because of the cost and capacity. MAPP of the Southern Kenai Peninsula (Homer) uses InsightVision, another online platform. Link here. There are different levels of storage units for our local community data and you and your coalition must determine the right fit for your needs and resources. Next month, we are going to talk about data stewardship. We will focus on having a plan for collecting local data, designating how that’s going to be done, and who will be the stewards of this important local information. Until then, may your data be stored well!